To me Cornwall is a wild and magical landscape still deeply in touch with its celtic roots and influences. A little corner of the British Isles where pixies and other fey creatures still roam. There's magic in the air. If you've never been to Cornwall you're missing out on a wonderful experience. This little book is one of those books that just mysteriously appear in your life. The short ghostly tales within capture beautifully the raw undiluted Cornish landscape and its lingering aura of forgotten arcane history. This is not the Cornwall that the tourists know and love but of the older primal Cornwall. The author, Mary Williams is just as mysterious as her wonderful tales. She has written dozens of books yet there is very little information about her. She was born in 1928 and lived in Cornwall from 1947 until she died at the grand age of 97. 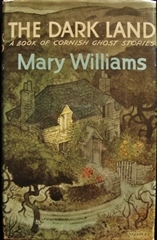 She has published an impressive 17 volumes of ghost stories as well as romantic novels, all set in Cornwall. It's a shame she is not as well known as other great Cornish writers such as Daphne Du Maurier who wrote Jamaica Inn and Rebecca, and Winston Graham, author of the Poldark novels. I really loved these stories featured in The Dark Land, so much so that when I had finished I simply started reading them again. This volume was published in 1975 and although some stories seem dated they are utterly charming yet macabre. Stand out favourites for me include Far End, Hickory-Dickory Dock and Guppa. Inside this book you'll find tales of lonely ghosts, macabre forces, shapeshifters, strange places that transcend time and avenging revenants. "At other times she explored the moors, with a sense of mounting primitive excitement as she neared the cromlech, a wild atavistic place of gaunt rocks, secret boggy pools and clutching wind-swept undergrowth. In great fingers shapes, the stones stood against the sky, defying it seemed, humanity's encroachment." Emily Bacon is a grieving widow who is determined not to let her grief swallow her whole, purchases an old run down cottage in a "very of the way place." deep within Cornwall. She has grand designs to restore the cottage and the garden to glory. She will begin again, but the locals aren't so keen. They do not want her there and try everything they can to make her leave, this makes her even more determined to stay and find out why she is so unwelcome.